The Director General of Djibouti Police Force, Col. Abdillah Abdi Farah was in Rwanda to cement the relationship between the two forces and a forge stronger ties. He met Rwanda’s Inspector General of Police (IGP) Emmanuel K. Gasana at the General Headquarters in Kacyiru. The two Chiefs of Police discussed issues related to ‘Police-Police’ cooperation, according to a statement issued by the Rwanda National Police. 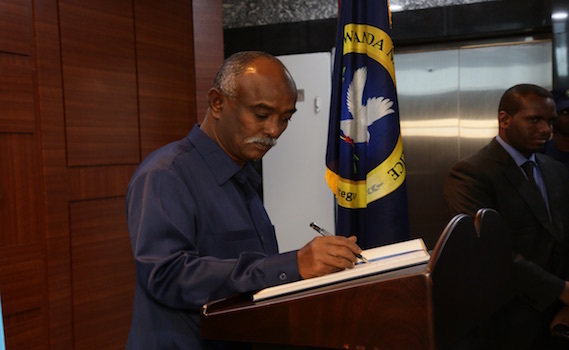 Col. Abdillah, who was in the country to formalize partnership with other security institutions including the Directorate of Emigration, was also accompanied by the Chief of Emigration of Djibouti, among other senior officials. “Rwanda and Djibouti have enjoyed strong relationship with special attachment. As Police, we have also been together in the regional and international forums. We, therefore, value this visit in the pursuit for our bilateral cooperation both as Police-Police, but also strengthen the South-South cooperation,” IGP Gasana said. Both RNP and Djibouti Police Force are members of the Eastern Africa Police Chief Cooperation Organisation (EAPCCO) with Rwanda the current chair of the regional 13-member bloc, and Interpol, among other police groupings. Under EAPCCO, Rwanda was entrusted to host regional centres of excellence in training, ending violence against women and girls and Peace Support Training centre, among others. Police officers from Djibouti have also attended the Police Senior Command and Staff Course at the National Police College (NPC) in Musanze. The meeting was also attended by Deputy IGPs; Dan Munyuza of Operations and Juvenal Marizamunda of Administration and Personnel. DG Abdillah reassured the two police institutions will continue to work together either within or outside their regional and international forums. The Director General later visited the Regional Centre of Excellence on Gender Based Violence and Child Abuse, and Isange One Stop Centre, which offers free medical, psycho-socio and legal services to victims of GBV and child abuse.